While positions like the Inverted W can increase a pitcher's risk of injury, the root cause of the injuries that plague pitchers like Jose Fernandez, Matt Harvey, and Stephen Strasburg are problems with their Timing. 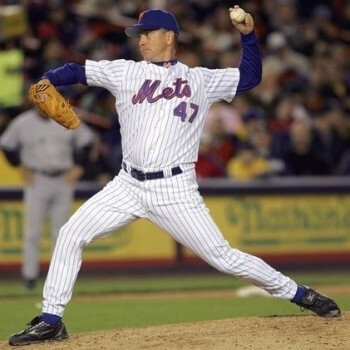 The difference is obvious if you compare and contrast dominant and durable pitchers like Nolan Ryan and Tom Seaver, and injury-plagued pitchers like Matt Harvey and Jose Fernandez, into front foot plant. 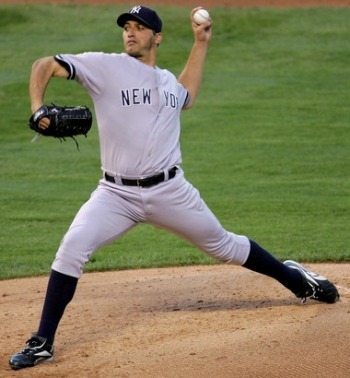 As I explain in my piece on Flat Arm Syndrome, the pitching arms of more durable pitchers tend to be more UP when their shoulders start rotating -- usually, but not always, at foot plant -- and the pitching arms of less durable pitchers tend to be more FLAT when their shoulders start rotating. Justin Verlander is an example of an active pitcher who consistently demonstrates superior Timing; a pitcher whose pitching arm is always UP and not FLAT into front foot plant. While my work and I have been widely criticized, most loudly by Jeff Passan in his book The Arm Dr. Glenn Fleisig said the following about Timing in an interview that was released on September 20, 2017. What are good and bad mechanics...you're using your whole body, if you're doing it correctly...proper mechanics is all about TIMING. You're moving your arm in concert with the rest of your body...One thing to look at in terms of a checkpoint is, when the front foot lands, where is the arm...if you're out of whack at foot contact, then you're probably screwed and you're going to put too much force on your arm. So some of the things we look at at foot contact is if the throwing arm is on its way UP...If the forearm was already vertical before foot contact, we'd call that an EARLY arm. If at foot contact the forearm is still horizontal, or the wrist is even below the elbow, that would be a LATE arm. What you want is you want your wrist to be above the elbow at the first time of foot contact and almost to the vertical position. That means your TIMING is good. I haven't talked to Dr. Fleisig recently, but it appears that he, and presumably ASMI, has adopted my entire framework for describing and evaluating pitchers, at least when it comes to Timing. And who are you going to believe, Jeff Passan or Dr. Glenn Fleisig of ASMI? 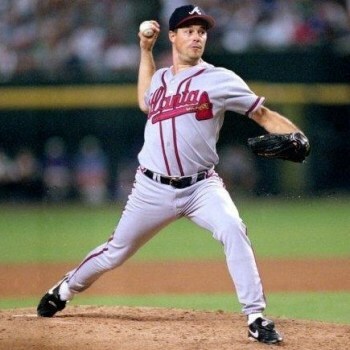 Tom Glavine made the Inverted W and never had a serious injury. There are also many pitchers -- Matt Harvey, Jose Fernandez, and Jarrod Parker, just to name a few -- who don't make the Inverted W yet still have elbow and/or shoulder problems. After starting this project with a focus on positions, and then being confronted by and wrestling with those two facts, by Fall 2007 I had come to realize that positions like the Inverted W -- while they were likely relevant -- weren't the whole story. Positions weren't the root cause of the problem. Something else was ultimately causing the injury problems I was seeing in pitchers. Timing: The position of the pitcher's throwing arm when their shoulders start to rotate, which is often, but not always, at Foot Plant. As I explain in The Science Behind The Epidemic, this focus on the impact of Timing is backed up by recent research. In the picture below, the critical thing isn't the height of Anthony Reyes' elbows. Instead, the critical thing is that Anthony Reyes' is still at the Inverted W position -- his pitching arm is flat or even pointing down rather than up -- at the moment his front foot has planted and his shoulders are starting to rotating. The forearms of most pitchers with a Timing problems aren't pointing downward at foot plant. Instead, they are flat or nearly so at foot plant, creating a problem I call Flat Arm Syndrome. If you contrast what you see in the pictures above with what you see in the pictures below, and the positions of the forearms at foot plant in particular, you will see a significant difference. In contrast to the FLAT forearms at Foot Strike of injury-prone pitchers, the forearms of durable pitchers are pointing UP up Foot Strike. Part of the reason why I question whether Tom House is the solution or the problem to the pitcher injury and Tommy John surgery epidemic is because his favorite cue is extremely problematic. As I explain in my piece on The Science Behind The Epidemic, my focus on the concept of Timing was well-placed. 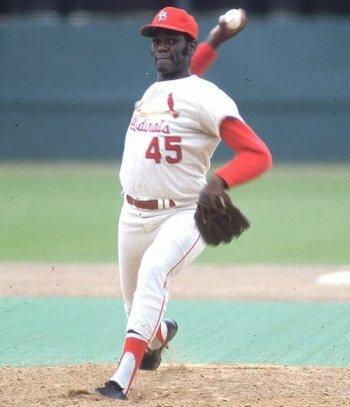 A 2012 study entitled Early Cocking Phase Mechanics by Dr. Weimi Douoguih, Medical Director for MedStar Sports Medicine and Medical Director for the Washington Nationals, suggests that the problem with the Inverted W isn't the position itself as much as the Timing problem the Inverted W tends to create. I am an orthopedic surgeon, and would like to offer you a theory on why the Inverted W is bad for the long term health of the shoulder. In the position of hyperabduction, elevation and extension of the distal humerus above the shoulder (inverted W) the inferior glenohumeral ligament is placed on stretch. The humeral head must lever against it to advance the arm forward. This ligament is the primary anterior stabilizer of the glenohumeral joint with the arm elevated (i.e. pitching). In other words, this position places this ligament under tension, then it is levered against in order to throw. This eventually will either loosen the shoulder, or tear the anterior labrum. It should be recognized this ligament is under stress during the "normal" delivery. If you traumatically dislocate your shoulder, this ligament is a key part of the pathology. Shoulder instability in turn leads to impingement, and other problems. Conversely, when the elbow is below the shoulder, this ligament would not be as stressed. Also, the specific use and timing of the muscles about the shoulder is critical. They have done muscle activity studies during throwing, and there are distinct differences between amateurs and professionals. There is also evidence for muscle use differences in the healthy shoulders, and the ones that aren't. ...I came to realize that the problem wasn't the Inverted W itself. Ultimately, my investigations into the phenomenon then made me realize that Timing was the root cause of the injury problems I was looking at. The connection to the Inverted W was that the Inverted W tends to -- but doesn't always -- create a Timing problem. In Frame 28, Mark Prior is at a position that I call the Inverted W (or simply The M). Notice how his PAS elbow is both above and behind his shoulders and his PAS forearm is hanging down nearly vertically beneath it. 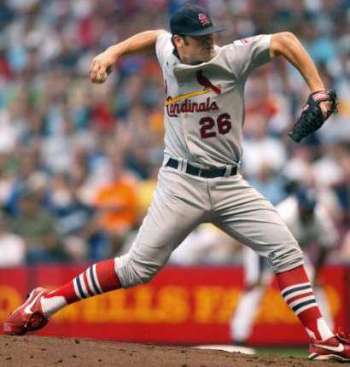 However, by coming to this position, Mark Prior is ensuring that his pitching arm will not be in the proper position at the moment his shoulders start to turn. As with pitchers with other timing problems like rushing, because his pitching arm is so late, he will dramatically increase the stress on both his elbow and shoulder. While the Inverted W isn't automatically bad, in Stephen Strasburg's case it does appear to create a significant timing problem...(T)his causes Stephen Strasburg's PAS upper arm to externally rotate especially hard and much...which significantly increases the load on the elbow and the shoulder...If you combine this with Stephen Strasburg's plus to plus plus velocity and the fact that he seems to be a fastball/slider guy, rather than a fastball/change-up guy, you've got someone who is putting tremendous, and likely excessive, stress on his elbow and his shoulder. If you doubt exactly what I said when, you can verify this quote using the Wayback Machine. What the not so durable guys do is they take their elbows back but they also take them up. Now, that's actually painful to do, but it's not that bad in and of itself. The problem is that when you take the elbows back and up, you can end up with a timing problem. This interview was either heard by or brought to the attention of Dr. Weimi Douoguih, the medical director of the Washington Nationals. As a result, he commissioned a study of the Inverted W and Timing to see if my claims had any merit.